Eurozone Recession On the Horizon? Is the first zone wide recession in the short history of the eurozone about to be registered? 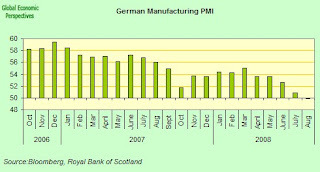 Certainly the flash PMI estimates for August give the impression that it might. The Royal Bank of Scotland Group Plc's composite index came in at 48 after 47.8 reading in July. Any result under 50 indicates contraction. Unfortunately we only get flash estimate breakdowns for France and Germany, but it isn't that difficult to deduce from the composite number that Spain and Italy continue to contract - although given that the composite rebounded slightly, while both services and manufacturing slowed in Germany, and in France manufacturing contracted more sharply in July while the contraction eased a bit in services, then it may be that Spain and Italy weren't contracting quite so strongly in August as they were in July. The German manufacturing index fell to 49.9 in August, its lowest level in three years, after slipping back index to 50.9 in July. Helping to push down the manufacturing indicator was the export component, which fell to its lowest level since June 2003, according to the report from Markit Economics. 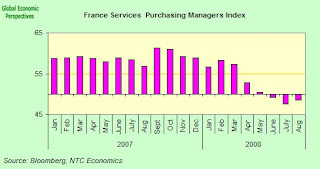 The services PMI reading was not much better, falling to 50.6 in August from 52.1 in June. 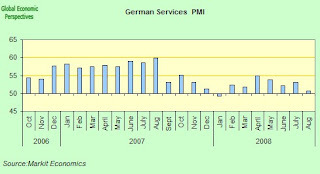 As things stand German services are riding just shy of contraction if the flash reading is borne out in the final result. In its report, Markit Economics noted that the business expectations sub-index for Germany had slipped to the lowest level since November 2002. 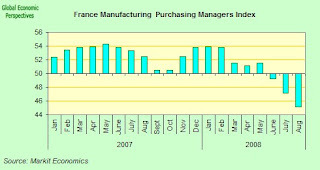 Activity in France's manufacturing sector contracted at the sharpest rate in over six years in August, with a contraction of 45.1 being registered, down on July's 47.1 and the lowest level since December 2001. The service index came in at 48.5, above July's 47.5 but still only its second time in negative territory since mid-2003. New business logged by service firms shrank at its fastest pace since the data was first collected in May 1998. "If you extrapolate these figures through to the third quarter you're probably looking at stagnation of GDP (gross domestic product)... This is not a harbinger of imminent upturn," said Chris Williamson at data compiler Markit Economics. "Nothing points to a fundamental turnaround... I think there's been a spillover effect from Italy, Spain and now Germany, and France has followed suit." Gross domestic product fell 0.2 percent in the second quarter from the first, when it grew 0.7 percent, according to the data released ny Eurostat (the European Union's statistics offic) last week, and it now seems clear that this contraction may well pass over into the third quarter. In fact Germany's Economy Ministry said only yesterday that the economic outlook in Germany has worsened even beyond the second quarter, when gross domestic product shrank for the first time in four years. European consumers are not getting much relief from falling oil prices either, since while oil prices have fallen 20 percent from a record $147.27 a barrel on July 11 the euro has dropped 7 percent ($1.4780 today) from its peak of $1.6038 hit on July 15, taking a lot of the edge off the drop. The fall in the euro will however make exporting outside the zone easier, the difficulty is that the demand for exports is slowing generally as the global economy slows. The European Central Bank, which raised its benchmark rate by a quarter point to 4.25 percent in July, currently predicts growth will slow to about 1.8 percent this year from 2.7 percent in 2007, but today's PMI data would seem to confirm that the ECB's growth projections are no longer realistic and that the time to move over into rate cuts mode is fast approaching.